Premium resort style living on the shores of Lake Erie. Marblehead Estates is a collection of luxury condominiums along the Lake Erie waterfront — both a gateway to Lake Erie and a destination in itself. There’s a reason they call us “Vacationland.” Marblehead combines breathtaking Great Lakes views with magnificently designed living spaces for the ultimate waterside lifestyle. The perfect home base for lakeshore adventures or a little R&R. Now this is the life. As one of the Midwest’s most beautiful beachfront properties, we’re your home away from home. Take in the alluring vistas from your private porch or balcony, or relax in palatial elegance with wide-open floor plans, abundant natural light and designer kitchens and baths. Green roof energy options and super insulated construction and design make our gated community both contemporary and comfortable. Thanks to our full groundskeeping and maintenance staff, you’re free to enjoy life resort-style. With the marina, clubhouse and pool just a short stroll away, all you have to do is have a good time. Make yourself at home at one of Northern Ohio’s most beautiful shoreline communities, rich in maritime history, culture and recreation. 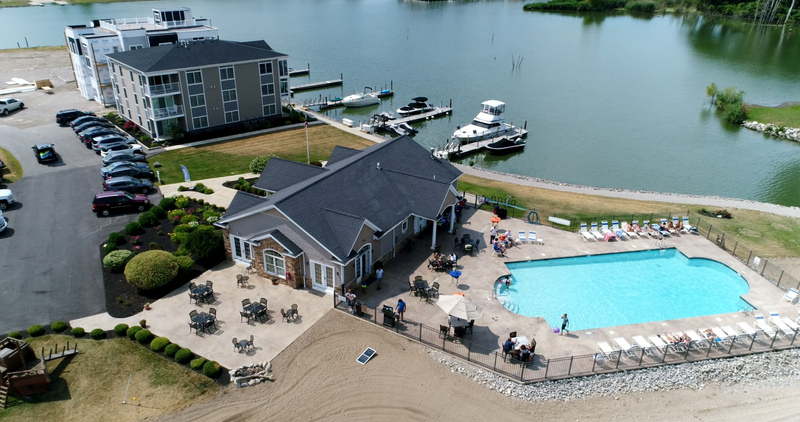 With premium locations on the shores of Lake Erie and Sandusky Bay, you’ve got everything you need to enjoy the lakefront lifestyle of fishing, boating and just taking it a little bit easier from sunrise to sunset — not to mention quality dining, shopping and entertainment. So whether you make it your day-trip destination or your summer-long vacation spot, Marblehead Estates is sure to give you spectacular views, comfortable living spaces and the splendor of paradise. We will be there, will you? Help us celebrate the start of the boating season! Join our first open house of the season after stopping by the Catawba Boat Show! Join us to kick off Memorial Day Weekend. Featuring one of our favorite local musical performers, Jerry Zsigo. We will also have displayed for viewing and purchasing some local art by The Group, a team of plein aire artists from around the area.